It is great honor to all of us and specially to the friends of FMIS to have Nobel Laureate Dr. Lin Ostrom with us this evening. In 1989, I had opportunity to participate in a seminar on Decentralization in Nepal organized by USAID at Blue Star Hotel. During the seminar, I had opportunity to meet Professor Larry Schroder, Dr. Jim Thompson of ARD and Professor Lin Ostrom. Next day evening, Dr. George Taylor of USAID invited me for dinner where Dr. Ostrom was also present. In that evening, I had opportunity to have dinner and discussion with Dr. Lin Ostrom. We had long discussion about the local institutions including the farmer managed irrigation systems in Nepal. She showed great interest in FMIS and she came to visit IIMI Nepal office next day. After long discussion about what IIMI is doing in Nepal specially study on FMIS and action research on intervention in Sindhupalchowk. Several case studies on FMIS and inventory of irrigation systems in Indrawati water shed were made available to her. A copy of irrigation inventory of Dhading district prepared by GTZ was also made available to her. Her first visit to Nepal became a very strong bond to continue further research on irrigation systems through her Ph. D. students. Among them are Shui Yan Tang, Rita Hilton, Wai Fung Lam, Ashok Regmi who looked into different dimensions of FMIS. She has other students in forest resources management. Most important activity was the establishment of “Nepal Irrigation Institutions Database” in collaboration with Institute of Agriculture and Animal Sciences, Tribhuban University. Data base was established at IIAS, Rampur as well as in Indiana University. They have been frequently updated but Data base in Rampur turned into to be inactive. However, Data base at Indiana University became a precious mine deposit to active inquiring minds. Along with Dr. Ganesh Shivakoti, book on Nepal FMIS was published. Dr. Ostrom has travelled many parts of Nepal going up and down of the hills, interviewing the farmers, travelling to the terai to look at the farmer managed systems. I would like to flash back the memory of 20 years ago visiting an irrigation system in Indrawati Watershed Basin with Dr. Ostrom. Near Baunepati on the bank of Indrawati River, getting herself ready by rolling knee up the trousers and taking off the shoes to ford Indrawati River by naked feet in that cold winter morning to visit Majha Kulo Irrigation system by climbing hill on the other side of the river for next one hour. Nothing prevents her to visit the irrigation systems and interact with farmers. She is really a field worker and believes that we can learn a lot from the farmers and villagers. She strongly believes that we learn from the farmers and we have to give to farmers what we have learnt so she propagated the idea of “ from farmers to farmers”. She is one of the investors to promote Farmer Managed Irrigation Systems Promotion Trust. FMIST was formed by like minded people with the initial personal contribution to the Trust about 12 years ago. Dr. Ostrom is one of them who provided seed money .She has been an inspiration to the FMIST. We had the honor of recognizing her as “the ICON of FMIST” in 2002 for her contribution to promote the knowledge on FMIS. Many scholars from Nepal have opportunity to associate with her in the irrigation study as well as in forestry resources management. We were so much delighted to learn that she won Nobel Prize in Economics in 2009. We were specially delighted to learn that Nepal Farmer Managed Irrigation Systems have also contributed in her theoretical base and her recognition of FMIS during her Noble Prize acceptance speech. We made the opportunity to screen Dr. Ostrom’s Nobel Prize acceptance speech at the inaugural session of the 5th International seminar. Participants of the seminar drew lots of inspiration from the acceptance speech. In our 5th International seminar on FMIS in March 2010, she was kind to send us best wishes for the success of the international seminar. We have included that message in the proceedings of the seminar which is already out of the press and FMIST would like to take the opportunity of presenting a copy of that proceedings to Dr. Ostrom. I would like to request Mr. Naveen Mangal Joshi, Vice Chairman of FMIST to present a copy to Dr. Ostrom. We have with us the “ ICONs of FMIST”. I would like to recognize Dr. Ujjawal Pradhan and Dr. Ganesh Shivakoti. 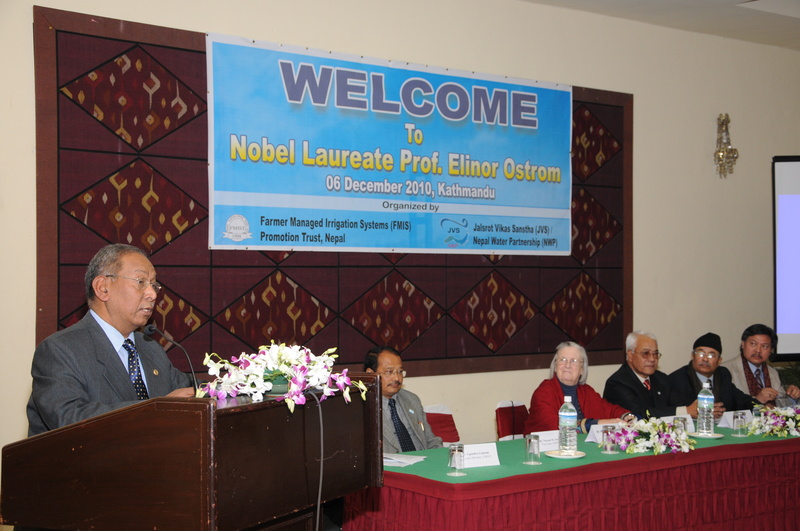 Both of them have collaborated with Dr. Ostrom in furthering the knowledge on natural resources management. I would like to welcome both of you on this occasion.